Want to learn what the cards have in store for you? In need of advice? Well then, let's see in this biweekly edition of Your Tarot Card Reading. Welcome to your biweekly Tarot Card Reading. Happy Holidays! Hope everyone is enjoying their winter holidays. Whether you are spending time at home with your family and friends or hanging back at Hogwarts, this is a great time to just take a breather before returning back to school. 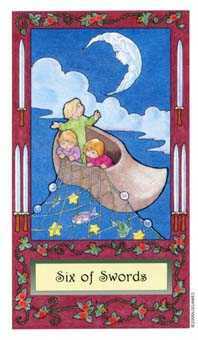 Unfortunately, I don’t have a Christmas themed tarot deck so I will be using the closest theme in my opinion, the Whimsical Deck. This deck is a bit special such that Wands are called Rods and Coins are called Pentacles. 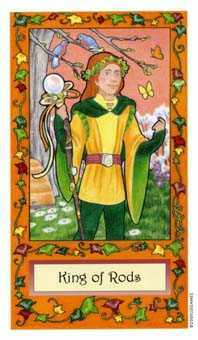 The King of Rods, or really King of Wands, represents your potential of becoming a pride inspiring authority figure. This is the time for your accomplishments to be recognized and your actions to become appreciated. You feel respected and prideful. However, don’t let that confidence cause you to offend the people around you. Be open minded and use your influence wisely while you still have it. Your situation looks really good right now. Combined with your new authority, the King of Cups predicts great guidance or reassuring support coming your way. This may be in many forms from a friend, to a professor, or to even an object. With both your powerful influence and wise guidance, you will find yourself in the most confident position you will have ever been in this year. Make sure to make use of this guidance to help you through this opportunity. Interesting. The Hierophant, a Major Arcana. This card perfectly completes the set predicted by both the self and situation cards. 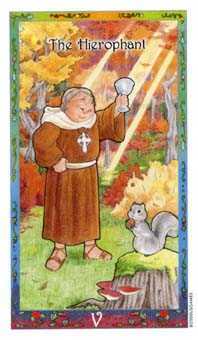 The Hierophant represents someone who is recognized and respected for their characteristics that may have been seen as weird to others before. This may be an ability that others might see as strange or dangerous or a habit that you may have that has been misunderstood. Use your new influence and recognition to help others with the same problem and expand on your unique ability. 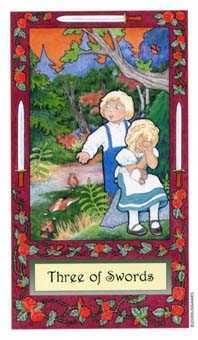 Nine of Rods, or really Nine of Wands, represents something that I’m sure all of us can empathize with, exhaustion. It’s been a long year, or at least it feels that way. This card also displays that Slyterin ambition pushing you to keep going even though all your body wants to do is just collapse and hibernate for the winter. Even though you might feel like work is constantly piling on top of you, take this holiday opportunity to just kick back and relax. You can finish it all later. For now, you need to relax and become mentally prepared for the workload later. The Six of Swords calls for you to open your mind to new perspectives in order to conquer all the invisible forces around you. Your situation might feel very frustrating because there just isn’t enough information for you to overcome it. Pay attention to your surroundings and your intuition. Sometimes you might see something that someone else is doing that gives you an idea. Other times an underlying memory might be the answer. The King of Rods, or King of Wands, calls for a challenge. This wise king represents the fine line between a bold respectable leadership and an irrritating dictatoral bossiness. This may or may not be a challenge you are having right now but it is understandable how one can be easily misunderstood as bossy. You are capable of great leadership. You just need to find a different, more innovative way to establish your authority without biased backlash. Seven of Swords. Definitely a good sign from the last tarot reading. You have just been through some tough obstacles and challenges and came out a winner. Coming out of this seemingly dark time, you have gained new skills and a new pair of eyes for the world around you. You have taken an opportunity and reversed the situation to your advantage. Now, you know how to conquer these challenges should you encounter them again. 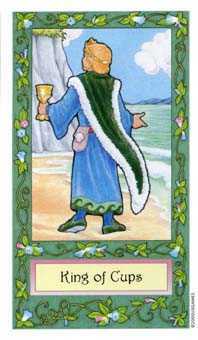 The King of Cups predicts a wise guidance and reassuring support in your future. After coming out the challenges a winner, you have a massive opportunity in front of you. This could be in the form of a friend, a professor, or maybe even an object that leads you on a path to success. During this time, open yourself up to others and you might find yourself creating more bonds and a compassionate environment. Ooo, the Three of Swords. Looks like your challenges are not completely over yet. The number three combined with the Minor Arcana of Swords represents facing hostility and the need of courage, something that is usually associated with Gryffindors. Even if you feel like you don’t have courage, you might be able to deescalate the situation before it explodes. The situation seems really frightening but don’t worry, you don’t have to face this alone. I’m sure with your Hufflepuff friendliness, you will be able to overcome this challenge in no time. 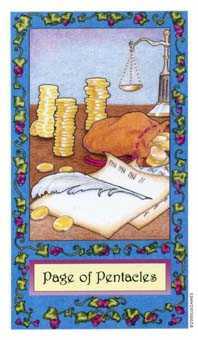 The Three of Pentacles, or Coins, is one of the most perfect cards to describe Ravenclaw in my opinion. You are in your creative mode. Ideas seem to be coming from every direction and inspiration is around every corner. 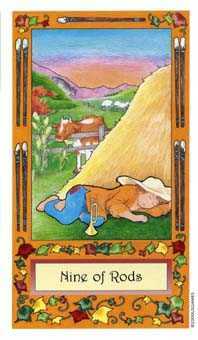 This card in the self position sets a positive tone for the rest of the reading. Your creativity will help you achieve great things if you allow it to take its course. 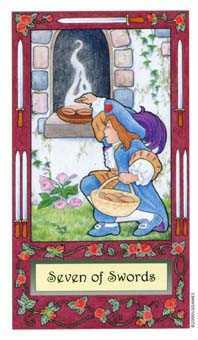 Page of Pentacles another member of the Coins Minor Arcana symbolizes the mind and thinking of a student. The situation you are in right now requires you to think as if you are a novice and to seek new insights. Others might be of great help during this time to help you bounce off your insights and give you new ones to consider. Use that creativity you are harnessing right now to figure out the best solution to your situation. 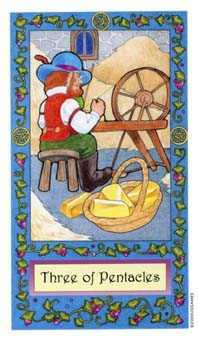 The Wheel of Fortune brings another challenge but it could become an opportunity depending on your actions. 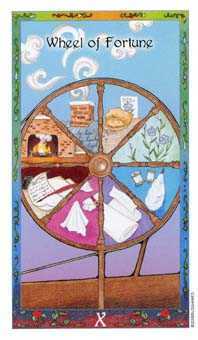 The wheel is forever turning and spinning new events that create seemingly unending change in your life. There is no way to determine where, when, and what the next change will strike but this is where your creativity will come in. While you try to go with the flow, you can come up with creative ways to adapt to the change. Learn the rhythms of nature and change your solutions accordingly. Thank you for reading this edition of Your Tarot Reading. Be sure to come back in two weeks for the next edition! Happy Early New Year! Hazel Green Nice one, Hannah!